it’s Monday morning and I’m sitting on the couch – blissful! As I worked on Saturday – and yes such a colloquium is damn hard work – I took off today. My husband did too as he watched the Super Bowl last night. He’s still asleep 🙂 Of course I didn’t even make it to the kick-off which is basically around 12.30 am around here. Never mind I really needed to catch up on some sleep and man I slept almost 10h! So I woke up this morning, well rested and hungry as a hunter. I’ve been repeating banana egg bakes for weeks on my WIAW posts and some of you asked for the recipe which I will share with you today. Only 5 min and one bowl are required to make this delicious and filling breakfast. Paleo and even Whole30 approved! 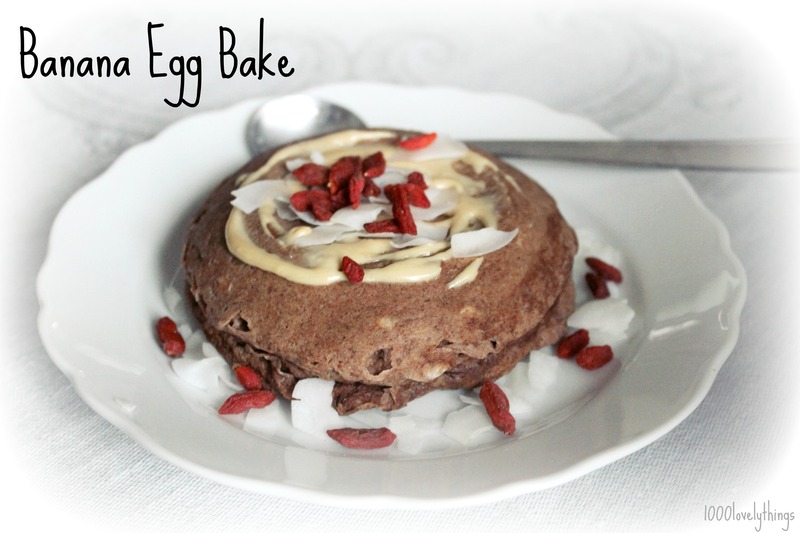 I just enjoyed one topped with some pb, shredded coconut and goji berries this morning. You can admire it on the photo above 😉 For now I feel a second coffee screaming my name. Actually I wanted to go for a run this morning but there was some really wet snow last night and the sidewalks are covered in icy mud. Not really inviting. As we already planned to go to Munich today I scheduled a long and exhausting gym session for this afternoon instead. I really feel I need it! Have a lovely Monday and great start to the week! YES!!!!!!!!!! This is perfect for whole30…well nearly without the almond milk but I might make an edit to it. Haha so I’m eating almost Whole30ish breakfast without even knowing 😉 You don’t need the milk for the egg bake. At first I always mixed only the eggs with banana and cinnamon. I just started to add milk for texture because I use way too much cinnamon 😉 And it gets fluffier with the milk. But it’s great without, too. Let me know how you liked it! This looks awesome!! I could totally make this and it would fit into my meal plan I’m currently doing. Plus it is much quicker and less watching time required than a banana / egg pancake! I am also pinning this one, simple but genius! Thank you 🙂 I love the recipe as I always get impatient when I want to have pancake and flip them too soon. I use to burn them and they never get fluffy. So microwaving is genius!